An extensive wildfire in Monterey County that began nearly a month ago is estimated to reach full containment by the end of September, Cal Fire officials said. The Soberanes Fire has scorched 81,396 acres since it was started on the morning of July 22 by an illegal campfire left abandoned at Garrapata State Park, Cal Fire officials said. There were 2,690 firefighters working to extinguish the blaze that was 60 percent contained as of Friday morning, according to Cal Fire. The blaze has reached areas that burned in past wildfires including the Basin Complex Fire in 2008 and Marble-Cone Fire in 1977, agency officials said. For the past three weeks, the fire had been anticipated to be 100 percent contained by Aug. 31, but investigators on Thursday estimated full containment would be reached by Sept. 30, according to Cal Fire. About 17,300 marijuana plants were removed from the fire area by Monterey County sheriff's deputies with help from the U.S. Forest Service Law Enforcement and Investigations and state Department of Fish and Wildlife, sheriff's officials said Thursday. The combined team conducted a two-day operation that also led to the discovery of 1,125 pounds of processed marijuana, 1,400 pounds of trash and infrastructure and 17 propane tanks that each weighed 20 pounds, sheriff's officials said. A private contractor hired to help with fire suppression efforts was killed while operating a bulldozer that rolled over on him about five days after the blaze started, Cal Fire officials said. Three others were injured while battling the fire, according to Cal Fire. The fire has led to an evacuation for people on Coast Ridge Road from the 1.5-mile marker to Marble Park, Cal Fire officials said. The blaze has destroyed 57 homes and 11 outbuildings and damaged three structures and two outbuildings, according to Cal Fire. The fire continues to threaten 410 structures, officials said. 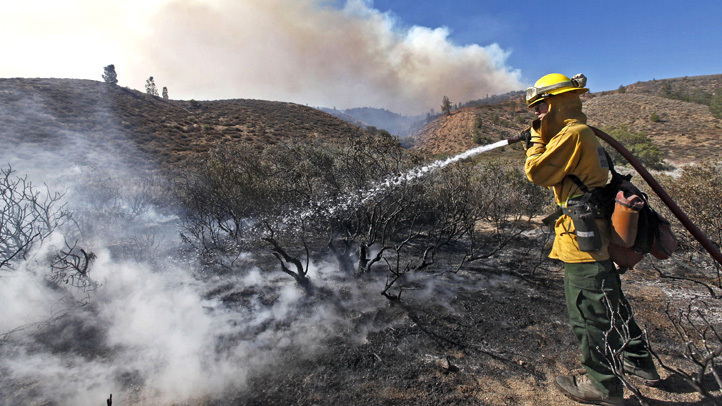 Closures also remain in place at Los Padres National Forest trails and roads in addition to state parks within the impacted area, Cal Fire officials said. Pet owners can find help for their animals displaced by the fire through The Society for the Prevention of Cruelty to Animals for Monterey County at 1002 Monterey-Salinas Highway in Salinas. Donations to help people affected by the fire can be made at the Big Sur State Park Multi-Agency Building at 47555 Highway 1 in Bug Sur, by phone at (831) 667-2315 or online. Anyone with information on what started the wildfire can call the Cal Fire tip line at (800) 468-4408.